Harvard Medical School addiction expert John Kelly wants to couch the language of addiction. “This goes beyond political correctness ... exposure to these specific terms induces [an] implicit cognitive bias." When confronting the power of addiction, the power of language is important to keep in mind, specialists say. The Diagnostic and Statistical Manual of Mental Disorders, the American Psychiatric Association’s diagnostic handbook, describes someone struggling with addiction as having “opioid use disorder.” But many of us are more familiar with “drug abuser,” as well as the term’s negative connotations. “It’s so hard for people to give up the ‘abuse’ word,” said Sarah Wakeman, medical director of the Substance Use Disorders Initiative and the Addiction Consult Team at Harvard-affiliated Massachusetts General Hospital (MGH), during an interview at her office. Wakeman has written frequently on the topic, urging people to adopt medically accurate, “person-first” language. The terms “abuse” and “abuser,” she wrote in an article published last year by the American Society of Addiction Medicine, “imply a willful misconduct and have been shown to increase stigma and reduce the quality of care.” Equally harmful, she added, is the language often applied to the most effective form of treatment. “The stigma surrounding the use of pharmacotherapy, in particular opioid agonist therapy, is arguably more potent and harmful than the general stigma about addiction,” Wakeman wrote. Drugs such as buprenorphine, which can curb cravings and withdrawal symptoms, are too often called a “replacement addiction.” To counter that misconception, the use of buprenorphine, which is marketed under the brand name Suboxone, should simply be called “treatment” rather than “medication-assisted treatment,” Wakeman said. Descriptions such as “clean” and “dirty” also have to go, Wakeman said. “A doctor would never tell a patient suffering from diabetes that their blood was dirty with glucose,” said Wakeman, demonstrating her simple rule for language choices. That power was clear in findings by Harvard Medical School’s John Kelly, who in 2010 conducted a pair of studies to test his theory that people exposed to certain terms associated with addiction display unconscious biases. Kelly, the Elizabeth R. Spallin Associate Professor of Psychiatry in Addiction Medicine, crafted two descriptions of someone struggling with addiction. In one paragraph he referred to the person as a “substance abuser,” which he believed might suggest the notion of willful misconduct and lead to more punitive approaches. In the other paragraph he wrote “substance use disorder,” a term he thought might convey the idea of a medical malfunction and lead to less punitive, more treatment-oriented attitudes. Kelly then randomly assigned the descriptions to 600 doctoral-level clinicians and asked them to answer a series of questions including whether the person should be punished or treated, whether he should be blamed for his condition, and whether he was a threat. Later Kelly repeated the test with the general population. In both groups the research found that “individuals who were exposed to the ‘substance abuser’ term had much more punitive attitudes toward the subject than if he was described as having a substance use disorder,” Kelly said. After the Medical School published the findings in its Mental Health Letter, word spread. Kelly traveled to Washington, D.C., to meet with Michael Botticelli, then-director of the White House Office of National Drug Control Policy, and he presented the research at the first national drug policy reform summit in 2013. Soon the White House adopted his recommended terminology. The work continues. 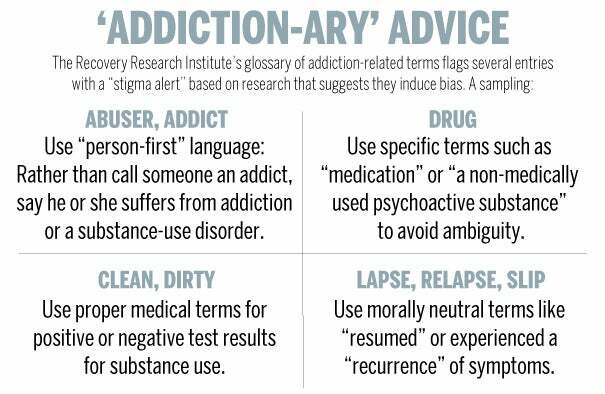 As the founder and director of MGH’s Recovery Research Institute, Kelly helped created a web tool called the Addiction-ary, a glossary of addiction-related terms including several words that come with a bold “stigma alert” warning. The national nonprofit Facing Addiction has adopted the tool, he said. “If we want addiction destigmatized, we need a language that’s unified and really accurately portrays the true nature of what we’ve learned about these conditions over the last 25 years,” said Kelly. Wakeman and Kelly are guest speakers in the free online course OpioidX: The Opioid Crisis in America. A study by Manny Medrano '19 (from right), with guidance from Professor Gary Urton, has decoded the meaning behind khipus, an Incan bookkeeping method of knotted rope.